While Olivia deBelle Byrd was repeating one of her many Southern stories for the umpteenth time, her long-suffering husband looked at her with glazed over eyes and said,“Why don’t you write this stuff down?” Thus was born Miss Hildreth Wore Brown—Anecdotes of a Southern Belle. If the genesis for a book is to shut your wife up, I guess that’s as good as any. On top of that, Olivia’s mother had burdened her with one of those Southern middle names kids love to make fun of. To see “deBelle” printed on the front of a book seemed vindication for all the childhood teasing. With storytelling written in the finest Southern tradition from the soap operas of Chandler Street in the quaint town of Gainesville, Georgia, to a country store on the Alabama state line, Oliviade Belle Byrd delves with wit and amusement into the world of the Deep South with all its unique idiosyncrasies and colloquialisms. The characters who dance across the pages range from Great-Aunt LottieMae, who is as “old-fashioned and opinionated as the day is long,” to Mrs. Brewton, who calls everyone “dahling” whether they are darling or not, to Isabella with her penchant for mint juleps and drama. Humorous anecdotes from a Christmas coffee, where one can converse with a lady who has Christmas trees with blinking lights dangling from her ears, to Sunday church,where a mink coat is mistaken for possum, will delight Southerners and baffle many a non-Southerner. There is the proverbial Southern beauty pageant, where even a six-month-old can win a tiara, to a funeral faux pas of the iron clad Southern rule—one never wears white after Labor Day and, dear gussy, most certainly not to a funeral. 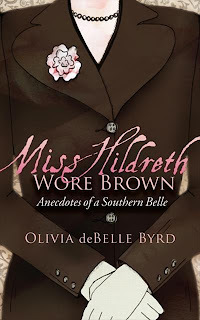 Miss Hildreth Wore Brown—Anecdotes of a Southern Belle is guaranteed to provide an afternoon of laugh-out-loud reading and hilarious enjoyment. Except for David Sedaris, I am no fan of short stories or even novellas. I'm all about the novels---the longer the better. It takes a lot, a whole lot, for me to really enjoy a book of short stories. So when I say that I enjoyed Miss Hildreth Wore Brown, it means a LOT. And I did enjoy this book. I would recommend this book to fans of short stories, people wanting to read about life in the South, or if you just want a good laugh. Some of the stories went off on tangents but upon further reflection, I think that adds to the fun. I read this book too and thought some of the stories were hilarious! This sounds like a fun read. Glad you enjoyed it.